We recommend our domestically located brides to give themselves at least 2 – 3 months before the wedding date to order an item. For our international brides, please try to order at least 3 months before the wedding date. This will allow us ample time to make sure you receive your veil on time with the most economical shipping option. With so many length options for veils out there, we know it can get pretty confusing. To make it easier on you, we created a information guide of what our shop offers in terms of veil style and length. Hopefully, this helps to clarify all the choices and guide you in choosing your perfect veil!! Below, we listed the different veil lengths from shortest to longest and a corresponding measurement of each veil length in inches. In case you’ve taken a liking to one of the designs, we’ve also included the name of the veil that is being worn for each length. Our measurements for the veils are just a suggestion. You are more than welcome to customize the length or width to your personal liking. Most customizations are based on individual height and length of dress. If you are looking to customize a veil length, please read on to find how to measure for the exact length! The suggested lengths offered above are generally pretty accurate for the average height of around 5’2” – 5’6”. However, measuring for the exact length is always the best way to ensure the veil fits perfectly to you and your dress! 1. Wear the heels you are planning to wear on your wedding day to make sure you are at the accurate height. 2. Use a measuring tape or piece of string to measure from the top of the head where the hair comb or pin will be placed to where you want the veil to end. If you want a veil that is longer than the train of your wedding dress, measure to where you want the veil to end on the floor. 3. Make sure to let the measuring tape or string lay naturally (do not pull tight) so you can get the most accurate measurement. 4. If you are using a measuring tape, please note the length! If you are using a piece of string, measure the length of the string with a ruler to get the final length. 5. Contact us to place an order with a customized length! Mention the veil design that you like, or describe to us what kind of veil you are looking for. We look forward to hearing from you and will reply as soon as possible! For brides who are just starting out in their veil search and aren’t sure of what they are looking for, we wanted to share a little information on the different type veils that we have available. 1. Blusher - A blusher is a single layer or the top layer of a tiered veil that is worn over the face. 2. Tiered Veil - Veils can have one, two or three tiers. They can come in all different lengths and widths. Long single tier veils are simple, classic and looks wonderful with most traditional wedding dresses. Many times when a veil has two or three tiers, the top tier can be used as a blusher. A blusher, as mentioned above, is the layer that can be worn over the face if desired. 3. Birdcage Veils- Birdcage veils are short veils that are worn over the face. They vary in length to cover the upper half of the face to a length that stops around the chin. This kind of veil works well with dresses with high necklines as well as sophisticated or eclectic wedding dresses. 4. Bubble Veils- Bubble veils are a great statement veil for chic brides. They have an extra voluminous look and the bottom of the veil is curved in to create a round/bubble design that can be seen from all angles. This type of veil works well with fitted gowns and is good for adding height if desired. 5. Drop Veils- Drop veils, sometimes also known as circle veils, are simple and elegant veils that drop over the face and is lifted at a chosen point during the wedding ceremony. (Think Kate Middleton or Kim Kardashian wedding veil.) Typically, there is no gathering of tulle on the comb, therefore no volume at the top of the veil, which also creates a very sheer look. Most of the time, the veil is secured with a hair pin or accessory like a headband or tiara. Our shop offers this type of veil with a hair comb that is hand sewn to the veil. Although if preferred, a hairpin is available as well. 6. Juliet Cap Veils- Juliet cap veils are vintage and 1920’s inspired veils. They are secured with two combs placed in your hairstyle slightly behind or above each ear. This veil can be single tier or double tiered, and if double tiered the top layer can be worn as a blusher if desired. The “cap” area can be plain or have some type of detailing like lace, beading, or rhinestones. 7. Mantilla Veils- Mantilla veils are typically worn high on the head, which allows the veil to curve down the side of the head and around the shoulders in an elongated oval shape. Our shop has raw edge designs of this type of veil, as well as lace lined edges. 8. Veils with Detailed Edges – All the veil types mentioned previously can be embellished in many ways. Our shop offers beautiful laces, rhinestones, horsehair, and satin edges that can be added to most raw edge designs. If you see a plain veil that you would like to add embellishments to, please don’t hesitate to contact us. We will do our best to work with you to create your perfect wedding veil! Yuri C. Wedding Shoppe veils are all currently made with bridal illusion tulle. Bridal illusion tulle is a fabric made of soft, synthetic fibers. We are working hard to add other tulle fabric options that will be available soon! We advise all brides purchasing a veil online to compare actual sample swatches to the dress to make sure they get the right color match, especially since we follow a final sale policy for all of our veils. We have two swatch sets available for purchase: The Classic set and Dream set. Purchase our swatch sets at www.YuriCweddingshoppe.etsy.com. All hair combs are metal and have wire teeth. 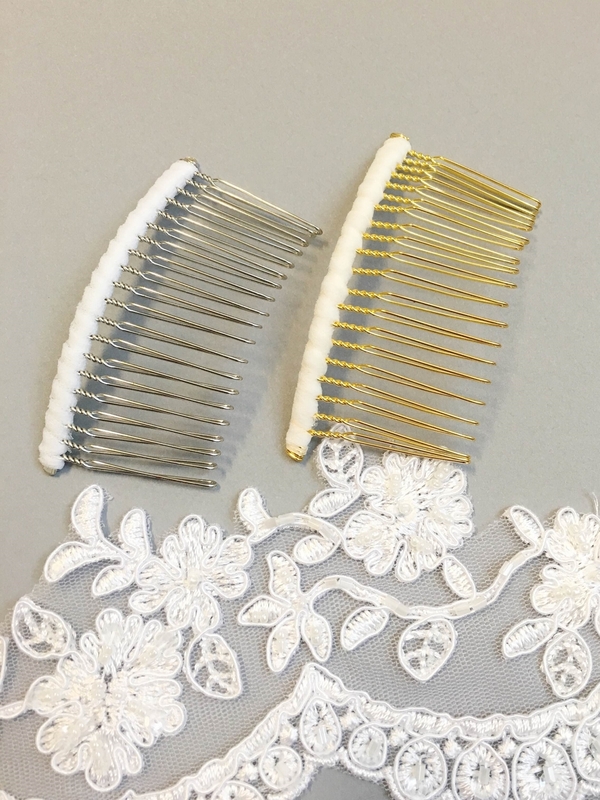 Most of our veil designs are hand sewn to our hair combs, but we do offer a few designs with an adjustable hair pin option available. There are a variety of comb widths, and each veil is already paired with the most suitable width. The edges of our combs are wrapped with tulle that matches the veil color that you choose. Unless otherwise requested, all combs will be a silver color. Gold combs can be requested by directly contacting us! 1. Try to hang up your veil as soon as you receive it. It can be folded and hung nicely on a hanger with a flat edge, in an area that is away from direct sunlight. 2. Place a garment bag or plastic bag over the veil to keep it undamaged and clean for your wedding day. 3. Hanging your veil will let some of the wrinkles naturally fall but the veil should be steamed a couple of days before the actual wedding. Please DO NOT iron your veil. The material is very delicate and the intense heat from an iron can easily discolor or damage the veil.